I remember back in October I was feeling really bogged down on a couple fronts – I was in the tail end of my certification program, parenting was occupying a lot of my emotional energy and we had just renovated and sold a family property so I was struggling to catch up on some business development that had piled up. My partner, Glen Murray, and I had planned to go with our TCM, Dr. Melissa Carr, up to Adams River to see the salmon run for a little daycation. I wasn’t sure whether a day on the road would be relaxing or if it would create more pressure in an already full calendar. Glen is a wise and patient man and assured me that the day would be memorable and well worth the trip. We bundled into the car early that morning (I don’t think I realized how early we had to leave Vancouver when I agreed to go) and set off to see the largest salmon run in 100 years. I love the feeling of roadtrips (even if this one started too early in the morning) because I get a delicious sense of freedom and discovery… With the open road before me, good tunes and company in the car and, of course, plenty of snacks, the day was mine to make of it as I wished. The backlog of work faded quickly as we put miles between us and home. One of the amazing things that I appreciate about BC is the lush beauty that surrounds us and it reminds me to get outdoors more often. 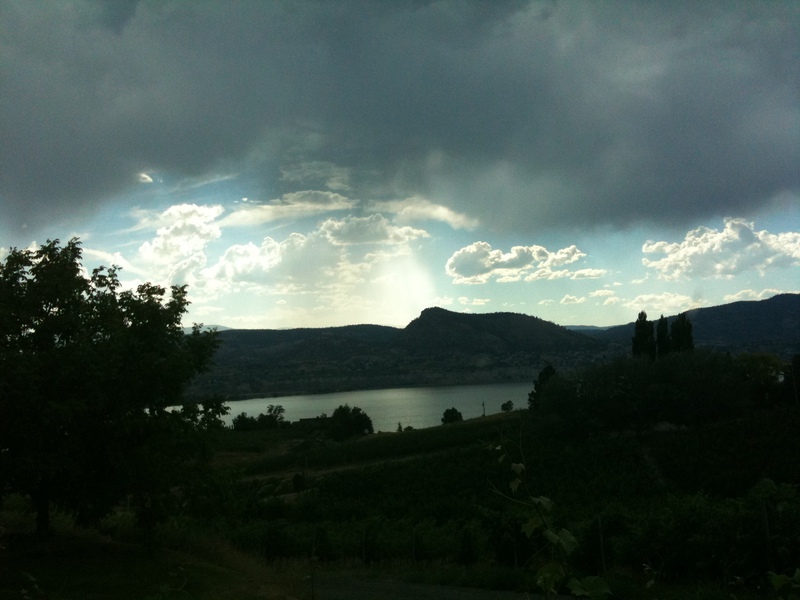 I am always refreshed, although sometimes also rained on, when I do. What I wasn’t prepared for was the sight of thousands of salmon, fighting against the currents and odds, to return to their nesting spot, find a mate and fulfill their part in the salmon circle of life. Before this trip, I knew very little about salmon except that I liked it with a little teriyaki or fruit salsa rather than candied. Fortunately, the Adams River Salmon Society (sorry, their site is down at the moment) had fantastic educational displays. Of all the eggs that are laid in the spawning grounds, only one in four thousand survive to return four years later to the Adams River. Something like half of all eggs make it through to hatching into little fry, half of the fry survive a year of growth in the lake and then swim out 480 km to sea, and only half make it past predators, fisherfolk, and nature to swim back the 480 km to spawn in the place they were born. Those are not odds in their favor for survival. The last part of their journey is in fresh water, where they cannot feed, and so their bodies begin to feed on themselves, changing shape and color as they stave off starvation. With their last reserves of strength, they struggle against the current to maintain a steady position, staking out territory and building nests to lay their eggs. The second they lose their grip, they are swept away by the river and have to make their way painstakingly back over the same rocks and other fish that are competing for mates and space. And then to top it off, as soon as their eggs are laid and fertilized, they die, their carcasses floating to the banks to become fertilizer to enrich the nearby land. 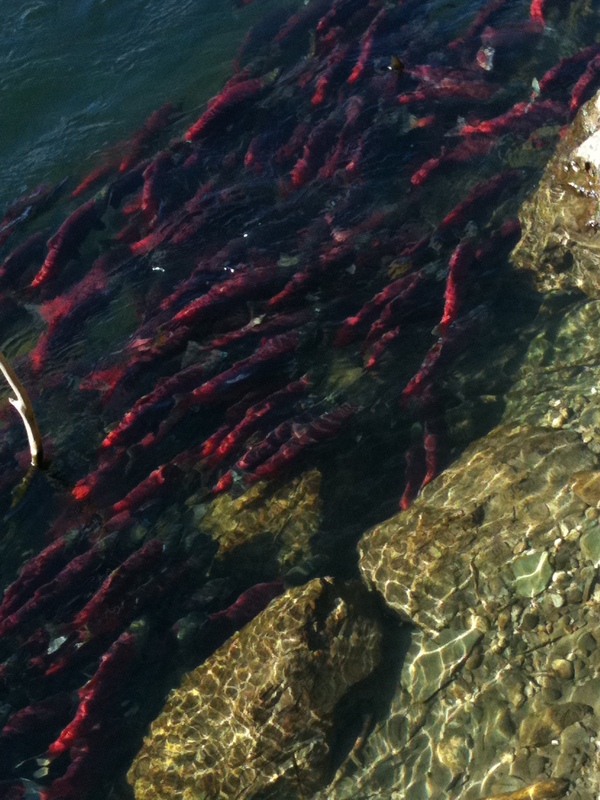 While the last days of their lives seem grim for the salmon, I felt inspiration in their determination. 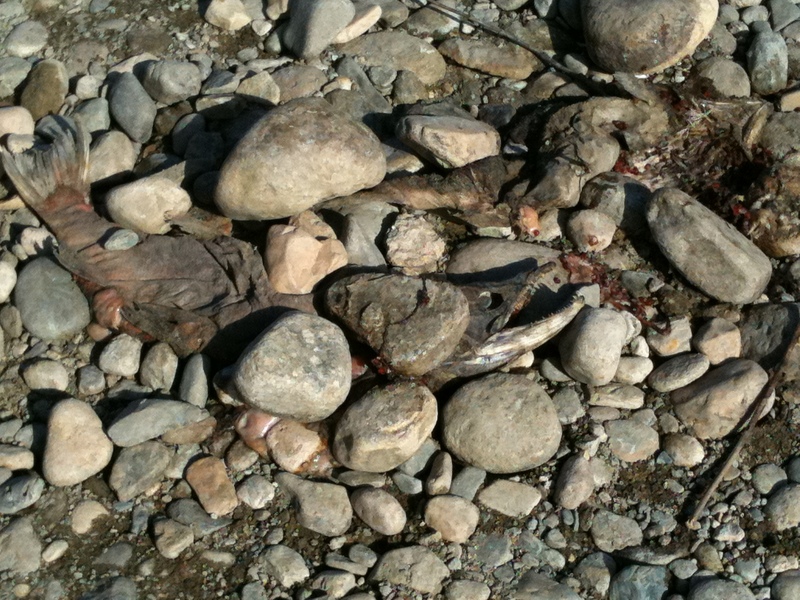 I found this scene on the rocks nearby the river and thought it was poignant: a male and female salmon having fulfilled their life’s mission, with life spilled out on the rocks. And it made me reflect on my life’s mission… and wonder how committed I am to seeing it through… Do I have the persistence of the salmon? This thoughtful, grounded woman on the bank of the Adams River was not the same as the person that had left Vancouver 5 hours earlier. I was changed by being in a different environment, experiencing something new, engaging with my surroundings and being open to what the day had to offer. …I have made it my mission to continue spreading this message of balance around the world. If we can do this with one dog, and one human at a time, maybe we can eventually bring that into entire communities and countries, so we can all live as my greatest teachers (dogs) do – mindfully aware, and emotionally in tune. To me, he is referring to connecting back with ourselves and being intentional with our actions. In our busy lives run by calendars, various phone alerts and overfull inboxes, it is really easy to slip into familiar ways of getting through our day. Our lower brains are really good at learning rote behaviors and we can almost switch off our active brains for things like getting between familiar places or dealing with routine functions. Have you ever arrived home and realized you weren’t really paying attention to how you got there? Or felt like you spent your entire day catching up, constantly behind and running to the next thing on your to do list? What are you missing when your mind and heart are not connected with your body? My daytrip was like that nudge in the side to snap me out of a habitual work-mode and to re-engage with the world around me and within me. I am sure I would not have had the same experience, sitting in my office at my computer, crossing off things that needed to get done. And absolutely, those things were still waiting for me when I returned. But I approached them in a different way – with fresh eyes and energy – after an afternoon at the river’s edge. New experiences shake up patterns and habits. We pay more attention to the details of our surroundings and are better able to hear what our senses are telling us. We stimulate the frontal cortex of our brains where we make decisions, weigh conflicting information, problem solve and direct higher learning and behavior. And here’s the thing for all you perfectionists out there… if you don’t know what the exact right thing is, do something else until you figure it out =) And while you are at it, send a comment and tell me what you are trying. What do you do to nudge yourself?